Find the best last minute deals and book your holidays in Funchal, Madeira’s capital. Funchal, the capital of Madeira, is home to more than 50% of the hotels in the Archipelago, and has a large range of accommodations to suit all tastes and pockets. In Funchal you can find accommodations from big hotel complexes to little inns with a personalized service, going through lordly houses or economic hostels. To have access to our last minute deals, you just have to select the dates in which you want to stay. Also, you can filter the results by accommodation type or minimum characteristics wished. 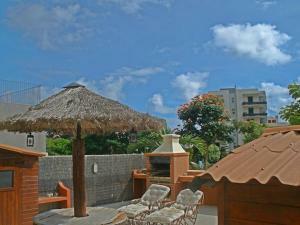 Located in Funchal, Bonimar Flat offers an outdoor pool and a fitness centre. This self-catering accommodation features free WiFi. The property is 3.3 km from Marina do Funchal. Set in Funchal, Ajuda Mar offers self-catering accommodation with free WiFi. The property boasts views of the garden and is 3.1 km from Marina do Funchal. Free private parking is available on site.